My Box Printing offers personalised hat packaging boxes made with corrugated-cardboard and silk card and has provided many business with their packaging boxes needs when they need elegant and durable boxes to pack their in-house hats. We will take you on a walk through specialties of our custom printed hat packaging boxes. Customisation: Our boxes are available in any custom shape and size that you desire. 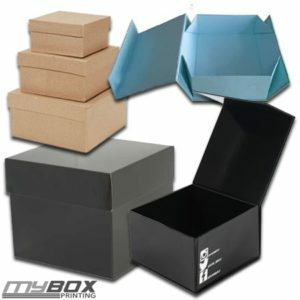 Material: We use 350gsm corrugated-cardboard or silk card to manufacture hat packaging boxes. Printing: Our state of the art printing facility is capable of custom printing in full colour CMYK or PMS. Lamination: Our clients have the choice to use matte or gloss lamination as finishing of their box. Plus the lamination doesn’t cost any extra dime. Digital Proof: We offer free digital proofing service to our clients. Turnaround: We deal every order in fast track manner and ship the items to our clients in 10-12 business days. Shipping: We use DHL and Royal Mail for expedite shipping and charge noting extra to our clients. We have announced a 10% discount on Christmas themed custom printed hat packaging boxes to celebrate Christmas. So if you want to avail this offer and receive your product before Christmas, we encourage you to send us your box specifications and we will get back to you with a quote.